The French Cuisine of VO—But With The Right Tools & Skills, It’s a Delicious Dish That’ll Make You Stand Out! If these ingredients are properly blended, dubbing can be done from the comfort of home and go fairly smoothly, but if you don’t know what you’re doing, you may find yourself in over your head. Don’t worry though—you don’t have to be a Julia Child in your recording booth to pull off this dish, but you will need to learn a few extra skills in order to get cookin’. One of the reasons voice talent operate their own studio won’t find a ton of prime time type animation is because of the ability to dub the voice to the picture. This takes special equipment and software, a ton of expertise, a great director and lots of patience. In fact it takes more time to edit and put this all together than it does to voice it and match to the picture. 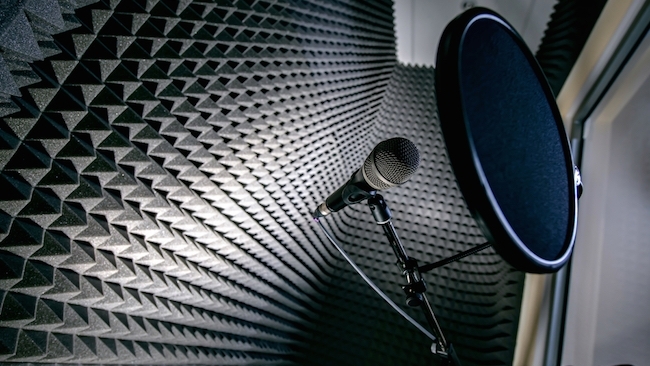 Many voice talent who excel in animation and want to work from their home studio pursue video games, apps and audiobooks as a replacement and will work the odd animation or short. The International market has crept in so strongly as of late, there is now a huge demand for dubbing voice to video in many different languages. There is a ton of work and opportunity out there for dubbing, however most of it is e-learning based and not easy to match for the talent when the original video footage is voiced in a completely different language. For dubbing that requires matching people talking—or matching “lip flaps” as I like to call it—is one of the hardest to do from a home studio setup without the right software programs and or devices that will allow you to record your voice while you watch at the same time and match. In a more professional studio set up you add time coding and beeps so that you are able to know precisely when to come in. This can prove to be very difficult to pull off on your own. The more common form of dubbing you will find working from home is when you have to match the timing of the video, not necessarily the person talking, so perhaps it’s animated, or you’re seeing b-roll footage (which are scenes (real or animated) that showcase what the narrator is talking about. Again the original video may have been in a different language and you’ll have to match for time or the video is already complete so the talent has to make it fit. Much like editing however, dubbing is very time consuming. Typically if you voice something for an hour, an experienced editor/talent can have this edited within 3 hours (including playback time). If it’s dubbing to video, it can sometimes take as much as 3 hours to dub 5 minutes. It really all depends on what you’re voicing and how well it fits to your natural pacing. You may be forced to re-write on the fly (if you have permission from the client) in order to make things work. You will have to voice, then edit, then make sure it matches (lining it up in a program such as Pro Tools or similar), then probably have to re-voice certain segments etc. So it’s very tedious work. Many times the talent are forced to compromise the integrity of the read in order fit the time of the animation. Again this takes a special skill and the more you try it, the better you will get. There are a few make-shift ways of dubbing that most talent have the capability to pull off, but perhaps patience is where the challenge will come in. If you use a quiet device in your studio such as a phone with video playback capabilities, a tablet etc, (careful with computers, they can make unwanted noise that will be picked up from your microphone) and place earphones in the device, you can try and match to the video with ease. This isn’t easy sometimes, but it has definitely saved me in a pinch when my program wasn’t working right. 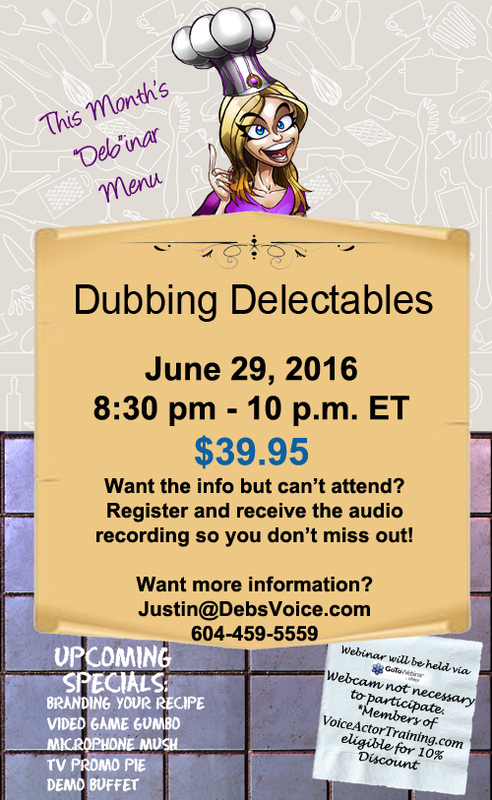 There is much more to discuss when it comes to dubbing, so if you want to improve your dubbing skills, learn about the craft or enhance your in-studio or at-home dubbing skills you need to tune into my Debinar on June 28th, 2016 for Dubbing Delectables. I will show you several examples of dubbing and how you can make it work from home. I will also offer tips and tricks for those of you doing dubbing/Walla in the local studios. Skills required and much more! Here is a direct link to register.